I’ve acquired a Federal Ordnance carbine, ser# 51048. On reading the M1 Carbine website, my ser# should fall into the receiver #2 category. 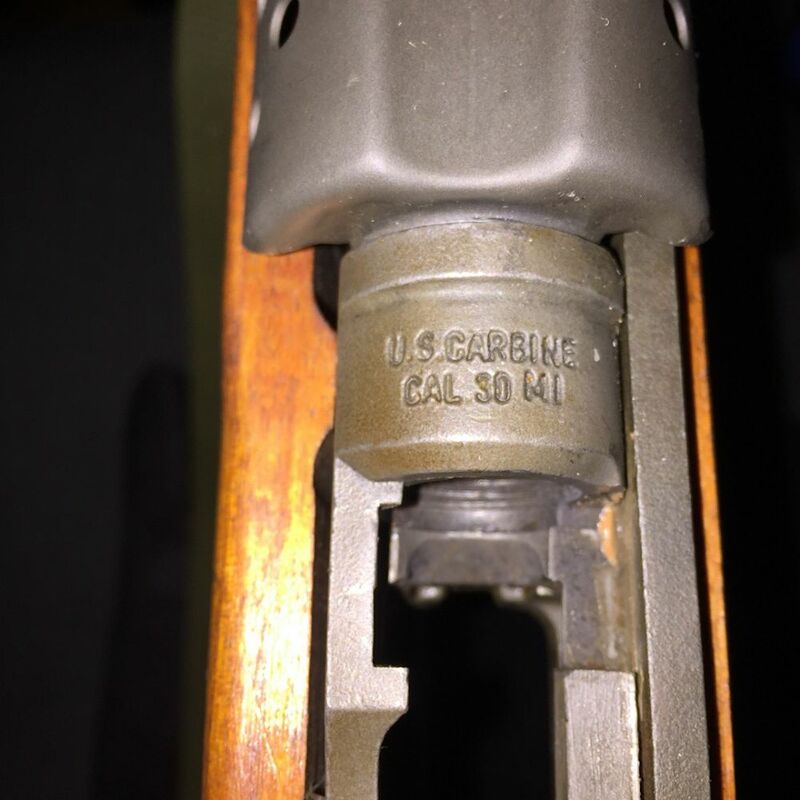 However the receiver is marked US Carbine Caliber 30 MI instead of the ML marking as shown on the website. Just wondering if anyone has any thoughts or comments on this discrepancy? Thanks. Possible leftover receiver from earlier production? Notice how the name is rotary engraved unlike the two shown on main pages. One looks stamped. Other as stated was cast in. Possible one of the other manufactures mentioned and had name growind off and their name applied? Serial looks applied after finish. I bet Jim M. will comment. Hi tnriverrat. Thanks for sharing the pics and info on your Fed Ord carbine. Some of the commercial carbine manufacturers, Federal Ordnance being one of them, assembled and sold carbines because they had acquired the parts to do so. Federal Ordnance being in the business of getting whatever they could wherever they could and importing it, it was common for them to do short runs based on what they were able to acquire. As opposed to companies like Auto-Ordnance and Iver Johnson who planned on the continuous manufacture of carbines and the parts with which to make them. Companies planning for a short run vs long term production frequently came up with a system of markings and serial numbers to meet legal requirements as opposed to an organized well planned production line with consistent protocols. In the surplus import business the theme has been to get them built and get them sold so they could move on to the next batch of whatever shows up. Federal Ordnance carbine production started when they found they had enough parts to assemble entire carbines with a few parts they needed being acquiring elsewhere. From the start of commercial carbine production by various companies in 1960 surplus receivers and barrels were always in short supply or non-existent. From the Federal Ordnance carbines I've owned and examined this appears to have been the case with the carbines they built. They may have had the barrels made for them but had the personnel with the experience to construct the ones they used. I have not been able to determine where or how they obtained their receivers but I recognize the casting mold marks and some of the casting features as being the same as the receivers used by Iver Johnson Arms in New Jersey 1980-1982. Continuing after the Iver Johnson operation moved to Jacksonville, AR in 1982/83 where they continued to use the same casting mold until 1987. Meaning Iver Johnson in Jacksonville, AR was producing carbines concurrent to Federal Ordnance carbine production. Who cast the receivers for Iver Johnson in New Jersey starting about 1980 and continued to make them for the Arkansas owners was Lamothermic Corporation in Brewster, NY. They currently cast the receivers used by both Auto-Ordnance and the commercial company using the name of Inland Manufacturing. Fed Ord probably didn't buy their receivers from Iver Johnson. They were competitors. They may have gone to Lamothermic and somehow talked them into using the Iver Johnson molds. The Iver Johnson bunch in AR did not make receivers. They used the leftovers from NJ that were part of the overall buy out. Then bought Universal Firearms and had them make their receivers. One scenario is IJ AR was done using the dies at Lamothermic and sold them to Federal Ordnance. Bringing this to why this is relevant, Federal Ordnance initially bought receivers that already had the U.S. Carbine Cal. 30 M1 markings cast as part of the mold. This was accomplished by the use of a name plate as part of the mold. With the name plates being removable and replaceable. Federal Ordnance then added their serial number and company markings to the receivers by whatever means was available to them. Initially it was done using a stamping mechanism/machine. This can be seen with the Fed Ord carbines having the s/n's starting with number 4. Something changed at Fed Ord somewhere between s/n 40851 and s/n F 51614. With 51614 and those after having the changes. Since I have to rely on what I see and what people share to reconstruct the history of what was done when, inevitably over time folks help fill in some of the blank areas. This is where yours comes in. Sometimes changes happen at a certain s/n and all thereafter have the changes. Sometimes the changes take place over a sequence of s/n's with the sequence being a combination of changes and no changes. The logistics of production. Prior to your post I had info on one other that fell between s/n 40851 and s/n F 51614. S/N 50992 has the cast carbine markings on the receiver ring with the mechanically applied Fed Ord markings behind the rear sight. It is absent the letter F. Meaning it's just like the 40,000 series s/n's. But I don't draw conclusions based on one exception. Now there are two. Maybe Fed Ord made the changes in 1985 during the 50,000 s/n block. But maybe they received the receivers having the changes in 1984 and didn't apply the serial numbers until they were into 1985. One common scenario is the person putting serial numbers on carbines (if it was just 1 person) had a box of receivers of both types that they just reached into the box and pulled a receiver from. Ask a simple question of Jim, get a confusing answer. Simple explanation is Fed Ord changed something and we don't know when, why, how they implemented it, or at what s/n if it was done starting with one particular s/n. With a few more owners sharing info that may change. S/N F 51781 shown as example #2 on the Fed Ord pages has the changes. They used a different name plate for the U.S. Carbine Cal 30 M1 markings. They added a name plate to the mold for the Fed Ord markings at the rear of the receiver. This may have been done due to damage to their contraption that applied the Fed Ord markings prior. As evidenced by the Fed Ord markings on your carbine having been put there with an engraver of some type. 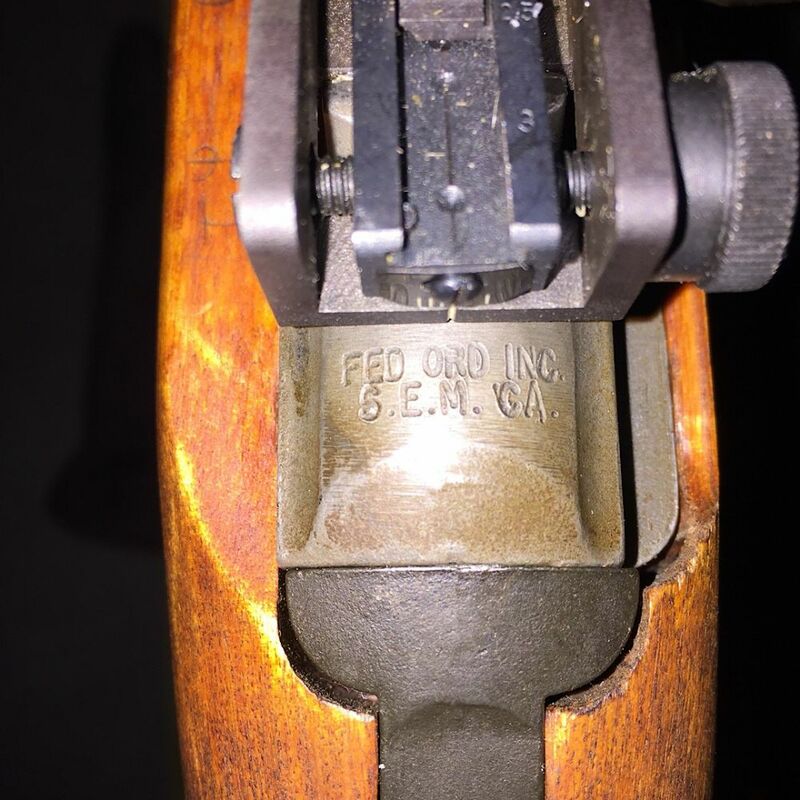 I have photos and info on one Fed Ord carbine like yours that has the cast carbine markings as used in the 40,000 sequence with the deep engraved Fed Ord markings. The receiver is absent a serial number. 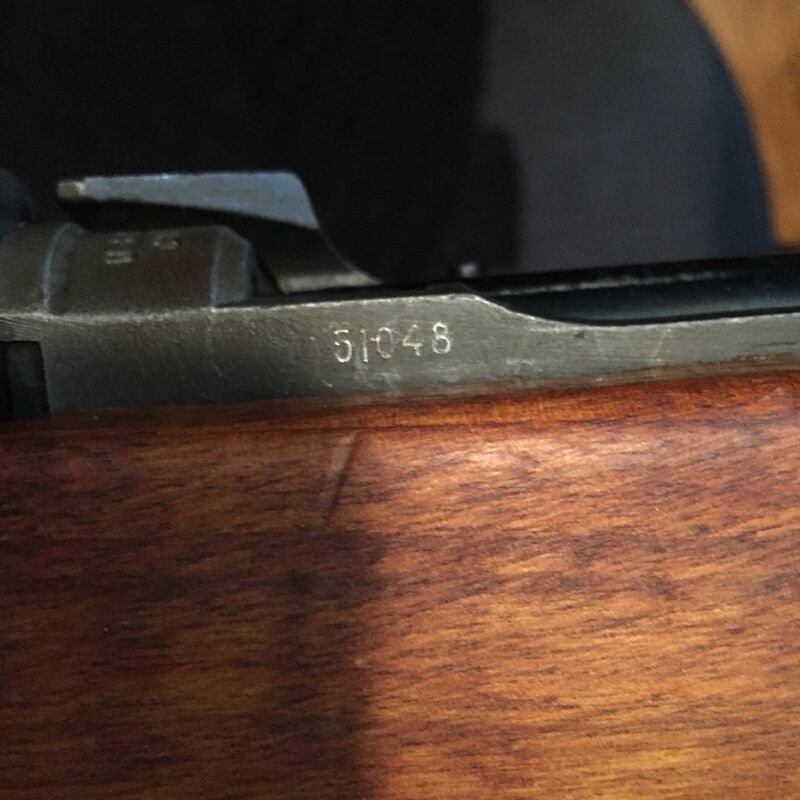 One reason for the long explanation is helping all who read it understand much of the commercial carbine production has not had a logical application of markings and serial numbers that remained consistent throughout production. As well as pointing out the companies who deal with imported surplus operate differently than the companies who are in the business of making a particular model gun over a period of time. I'm making some changes to the Fed Ord web page to correct a few things and add a short explanation regarding the change in markings in relation to the serial numbers. Thanks to all and especially Jim! Jim your explanation, and certainly not long but thorough, helps me understand it. Glad to have found this site!! I for one, never tire from reading Jim’s post. Obviously to him, it’s a labor of love and we benefit from it.